Well, the rooks were wrong about Winter passing, at least for now. As much of Minnesota is covered with a foot or more of forgetful snow, with more remembering to fall over the top of us all day, it’s a good time to return to T. S. Eliot’s landmark of Modernist poetry “The Waste Land,” the poem that, by beginning with the famous line “April is the cruelest month” is largely responsible for National Poetry Month being set in April. but “The Waste Land” will soon get stranger and darker than anyone expected in 1922. We’ve been performing it on the installment plan this month, following up on our performance of the first segment of it last April. But, it occurs to me that because so many of our listeners hear us via the podcast section of Spotify, which perversely doesn’t allow podcasts to be placed in playlists, that it might be good to combine what we have completed into one longer piece. 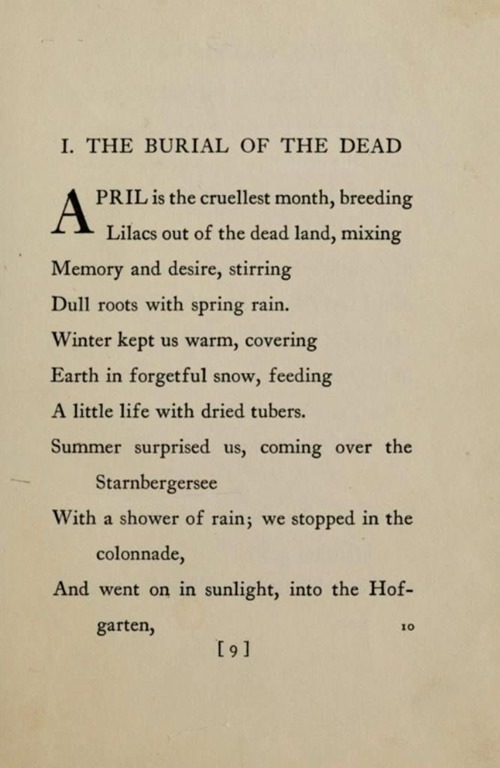 So, here’s the more-or-less complete first section of “The Waste Land” titled “The Burial of the Dead.” Eliot intended his poem to be musical, so even though it’s sprawling and includes many voices, it’s been fun to make audible the musical implications in it. As I do this, I’m reminded again of my first encounter with “The Waste Land.” I didn’t understand any of it—well, that’s not completely true, I could extract meaning from a few lines—but the whole thing could just have well have been a symphony with notes in place of words. Even now, for me, “The Waste Land” remains a hard poem to love, and unlike many poems and poets of our current scene, it’s not asking us to love it. So, if it’s hard to understand, and hard to love, why listen to it? Because it is a great poem? I doubt that would work. Because it was so influential historically? Well, that influence is now largely historical. It did move things powerfully one way, and then, after decades, things moved another way, in part in reaction to it. Because there are still fresh experiences to encounter in it? Now we’re getting closer. Art isn’t immortal only because it’s great in some ideal way, an art work’s immortality happens from our mortal human actions, our human reactions to it, and some of those become richer when the work has become strange to us from a change in fashion. But in the end, I ask you to listen to it consistent with our overall tactics here in the Parlando Project: listen to it as music first, do not worry at the overall meaning immediately. I hope I can illuminate some meaning with my performance and music, but simply to comprehend “The Waste Land” as this suite of voices and moods is to comprehend much. Here’s the player gadget to hear “The Burial of the Dead.” Since it combines what had been four pieces issued separately here, it’s longer, at 13 minutes, than our usual stuff. If you’re looking for something brief, why not take a random walk through our archives for one of the more than 200 shorter pieces we’ve available.